Now THIS is how you run an English class website! the view I see each year from the beach at home. I can’t forget. This morning, between classes I was sitting in my car listening to the radio. I listened to the children read off the names of those who perished in the WTC disaster. As I listened to the small voices read the thousands of names, tears ran down my cheeks. I managed to miss hearing the names of anyone I knew, but still……. I can remember that day like it was yesterday. I remember eating breakfast with one of my best friends, Erin (we barely even knew each other at the time, having moved into our freshman year dorms only a few days earlier). The dining hall had talk radio playing over the speakers and they were talking about the WTC bombing. I remember Erin and I wondering why they were talking about something that had happened in 1993. We tuned out the radio as it became nothing more than white noise in the background. Quickly, we finished breakfast and I went to my Women and Public Policy class. As my classmates settled into seats in the small lecture hall, our TA, Jen, apologized for having to keep her cell phone on during class. She explained that she had flight reservations later that day, and she needed to keep up on any airport delays due to the incident in the city. That was the first that I heard about a plane crash, as the TV in my room wasn’t hooked up yet. (We had moved in only days earlier). But everyone in class seemed fairly calm. We talked about what had happened for a few minutes, but most of us assumed it was just an errant pilot; a tragedy, but nothing too life-changing for the majority of us. So from 9:50-10:30am we continued on with our normal class schedule, discussing women in the current political system. As class ended I remember walking back to the dorm, over the Hickman Bridge, and hearing people around me say classes were canceled for the rest of the day. Yet I still really had no idea what was going on. I walked back to my dorm on the other side of campus planning to turn on the news while I got organized for the day. Then I remembered that I didn’t even have a tv (stupid no cable in the dorms). As I walked into the building, you could sense the panic. The stress and tension in the air was palpable. I walked up the 3 flights of stairs to my room and immediately saw that my answering machine was blinking wildly. Each message was from my mother, trying to get in touch with me. I grabbed my cell phone to call her back, but by that time the lines were down. As I kept hitting the redial button I watched my floormates pace up and down the halls. One of the girls walked past my door no less than 20 times in 2 minutes. She was trying to get ahold of her father, who worked in the Towers. Others were just trying to find their parents even if they didn’t work in the city. Unable to get through to anyone on the phone, I took my cell phone and walked back downstairs to the lounge and sat on the couch with my dormmates, staring at the images that were being flashed on every station on our common room TV. No one spoke. Still dialing, I headed back upstairs to my computer, sure that I would be able to find more information on the internet. The news anchors were so unsure and so frightened. I finally got through to my mother (while reloading news sites over and over) and she was relieved to hear from me. She told me you could see the flames from the beach by our house, and that there was a huge cloud of smoke and a smell enveloping Middletown. She asked if I wanted to come home, and while I considered it, I chose to stay. I wanted to be with my friends, and admit that the idea of driving home was frightening. None of us knew what was happening or what would happen. The panic in my dorm just increased all afternoon. My friends and I sat in stunned silence watching the television coverage. At one point, military planes flew over the campus, and people ran for the basement. No one knew what would happen next. That sense of terror was something unimaginable only hours before. We watched the news for hours on end. I IM’ed and recieved IMs from friends who were at school in the city. People I hadn’t talked to in months came to mind. I went to a tiny high school, 60 kids to a graduating class, and our network of students was reaching out to one another. We just needed to know that everyone was all right. I remember the anxiety we felt while we checked on all the Maryland people, friends who went to school near the Pentagon and Washington, DC. Eighteen years old and we were frantically searching for people just to make sure they were still there. Only a few minutes later my mother got through to me again, telling me that my brother’s best friend’s dad was missing. That’s when I made the decision. I went home. I stayed home. School was canceled. The next few days were filled with phone calls “Did anyone hear anything? Any word?” My mother told me how on September 11th, ferries came from the city to the local harbor. Ferries that were based all over NY just packed with passengers from NYC. People who just had to get somewhere besides Manhattan. They stumbled off the boats- people covered in ash, people in shock. They were hosed down immediately by men and women in hazmat suits, for fear that they were carrying biological agents. The papers talked about how Middletown was the town in NJ hit the hardest by the tragedy. We lost so many. So many people from my church, people I knew from middle school and high school. Then, my worst fears were realized. A friend was put on active duty. Along with all this tragedy, I had to deal with the idea that one of my best friends could be sent into the city. At that time, it was a terrifying thought. Would NYC be hit again? Were we safe? Later, I learned that another friend had worked at the pier in Jersey City on September 11. Unloading and loading ferries and boats, for days at a time. But her story had a happy ending- she became engaged when she grew closer to a friend who took care of her at the time. My brother spent days with his then-girlfriend and their best friend. A sophomore in high school and he was trying to hold up his friends while they learned that a parent was never coming home. I admired my brother immensely for the strength he showed in those days. He grew up more than I ever knew he could. My current students were between two and six in 2001. September 11th is a distant memory for some them, something their parents and other adults talk about. The younger students don’t have a memory of that day and only know about it from clips on TV shows. For me, it is hard to fathom not being able to articulate exactly where I was that day, that hour, that minute. 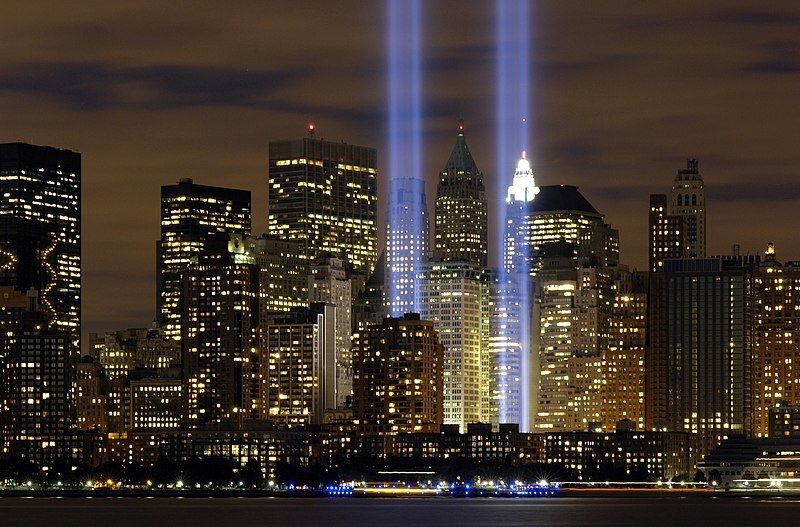 While I am glad they have no memory of the terror our nation, especially the tri-state area, experienced that day, it still leaves me stunned. It’s such an integral part of my life that I can’t imagine it not being a cornerstone in others’ lives. Yet I am grateful for that blessing, too. I am a huge fan of Erin Condren. I stumbled upon the company about two years ago while reading some blogs. I first fell in love with her Life Planner and snagged one for myself on sale. Thus, an addiction was born. I also am a avid user of Erin Condren’s teacher lesson planner. For the past two years I have ordered a personalized planner and used it to keep my daily notes. I do my lesson planning on Googledocs, but every day I keep my lesson planner open on my desk and I jot down what article we read from the paper, what I finish in class, what needs to be done, etc. Then I look back at my notes when I sit down to make my plans for the next week. 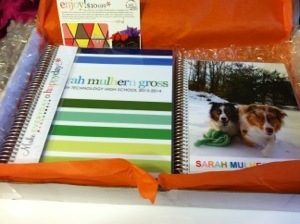 This year, Erin Condren’s team contacted me and asked if they could send me their new updated teacher planner. Of course I said yes! 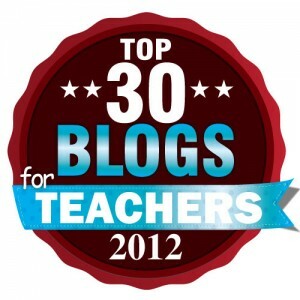 I was already planning to buy the updated version and what teacher can turn down freebies? The money I would have spent on the planner bought a few more books for my classroom library. I spent a long time deciding which cover I wanted for this year’s planner and how I wanted to personalize it. I finally decided and also added a notebook to the order. (I couldn’t pass up the notebook. Hello, my name is Sarah and I’m a stationery addict). Erin Condren orders take about 3 weeks, as they are personalized and put together by individuals. Well worth it, in my opinions! My order arrived right on time. So pretty! I appreciate my order being nicely wrapped. 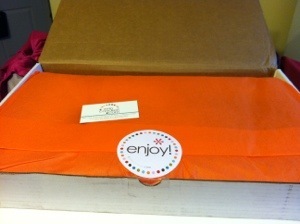 Last time my order was in purple tissue paper and the delivery box was decorated beautifully! Here’s my planner (on the left) and my new notebook (on the right)! Love, love, love these products. Seriously, I’m obsessed. The inside of the planner is full of inspirational quotes, bright colors, and useful organizational tools. There’s a 2-page monthly calendar followed by weekly pages for planning. The weekly pages aren’t dated so you can start using the planner at any point during the year. I’m obsessed with the colorful stickers that come with the planner and use them all the time. The stickers say things like assembly, IEP meeting, class trip, vacation, and lots more. There are 180 stickers in all! There’s also a folder at the back of the planner, which I use to hold important papers. My class list is there and I make sure I have my planner during fire drills. The plastic pouch holds my attendance sheets and a pen so I am always prepared. You can see all the features of the planner in video below. *I received this order for free but the opinions are entirely my own! It’s no secret that I love and adore Jessica Darling and Megan McCafferty. Jessica Darling is my spirit animal. She is my bosom buddy. Sometimes I think she is me. I’ve read the Sloppy Firsts series multiple times and I have recommended it to many friends. So when I read that McCafferty signed a deal to write a middle grade series starring Jessica Darling I was thrilled. I was even more excited when I was randomly chosen to receive an ARC from a contest on Twitter. As soon as the book arrived I sat down and read it in one sitting. 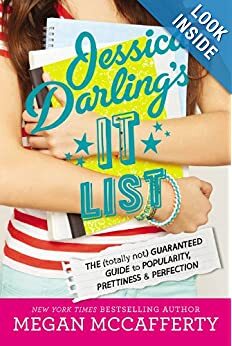 If there are middle school girls in your life, I highly recommend Jessica Darling’s It List: The (Totally Not) Guaranteed Guide to Popularity, Prettiness & Perfection. This is the first in a series where Jessica is trying to navigate middle school by following advice from her older sister, who provides her with a guide to being on the “It list”. The voice is distinctly Jessica Darling but is age appropriate. She’s sarcastic and a realist, but appropriately so for a middle schooler. Jessica does her best to follow her older sister Bethany’s advice as she begins her time Pineville Junior High. But Jessica is not her sister and things are not as easy as the list makes them seem. Making Cheer team? Hanging out with the cool crowd? Dressing right? Any middle schooler who has struggled to fit in will identify with Jessica and her witty, sarcastic voice will make them laugh as they see themselves in her. I can’t wait to share this series with my middle schoolers and ninth graders. I think it will be a perfect introduction to Jessica Darling and will make many of them want to pick up the Sloppy Firsts series. I am also recommending it to anyone who knows and loves Jessica Darling already. Meeting her, Bridget, and the rest of the gang (MARCUS FLUTIE!!!) as 7th graders is a fun look at the world of Pineville before Jessica grows into herself. I am looking forward to the rest of the series!